On Friday April 22nd 2016, there was a Requiem Mass for Rosalind Leney, who was a regular worshipper at St Michael & All Angels and a pillar of musical life and education in Chiswick. It was attended by many of her friends from St Michael’s and the Blenheim Music Circle, as well as former pupils and their parents. Miss Leney taught the piano to generations of children and and took great pleasure in spotting and nurturing talented young musicians. She founded the Blenheim Music Circle, which put on Sunday afternoon concerts at the Chiswick Catholic Centre every year from 1987 to 2015. She was a stalwart supporter of the Bedford Park Festival – and one of only three Fellows of the Festival – during which she hosted lunchtime concerts in her beautiful studio (above), followed by a picnic in the garden. Photograph by Dr David Budworth. There will be a Thanksgiving Evensong followed by a Concert in St Michael & All Angels Church during this year’s Festival, on Sunday June 19th 2016. From a homily at her Requiem Mass by the Vicar of St Michael & All Angels, Fr Kevin Morris. Born in Dover, Rosalind grew up in the village of Yalding, between Maidstone and Tunbridge Wells in a beautiful Lutyens-style house with a lovely garden and orchards. They had maids, a cook and a nanny and Rosalind was the middle of three sisters all of whom were sent to boarding school in Malvern from the age of 10. As a child Rosalind had epilepsy and had to be withdrawn from school and educated at home for three years. During the war her mother had hosted concerts in their house to raise morale and it was then that Rosalind realised she wanted her life to be about music and in the future to have similar concerts in her own home. After school she entered the Royal College of Music studying Piano, Viola and Piano accompaniment. Her great love was chamber music and she continued to study Lieder and Chamber music after she left. She played with the Schubert Trio, which played at the final concert of the Salzburg Summer School, where another finalist was the young Daniel Barenboim. Rosalind played in various music club concerts and gradually got into teaching – in a boys prep school, then St Catherine’s School Bramley and afterwards at the Richmond School of Music. When that closed, Rosalind continued to teach about 30 pupils privately and she was still teaching until very recently. Rosalind travelled extensively. In the late 80’s she was invited to join a group of 20 piano teachers to visit China to observe how they taught music over there. She observed that the young pianists were taught to keep their wrists very low and that they were not allowed to teach the Chinese anything! At about the same time, in 1987, she formed the Blenheim Music presenting six concerts a year and stimulating interest and enthusiasm for live music in Chiswick. She began by asking people if they would like to hear good classical music locally and if they replied yes, would then cajole them into coming to concerts or to joining the committee. Rosalind was a committed and devout member of St Michael and All Angels and had a great love and support for church music. 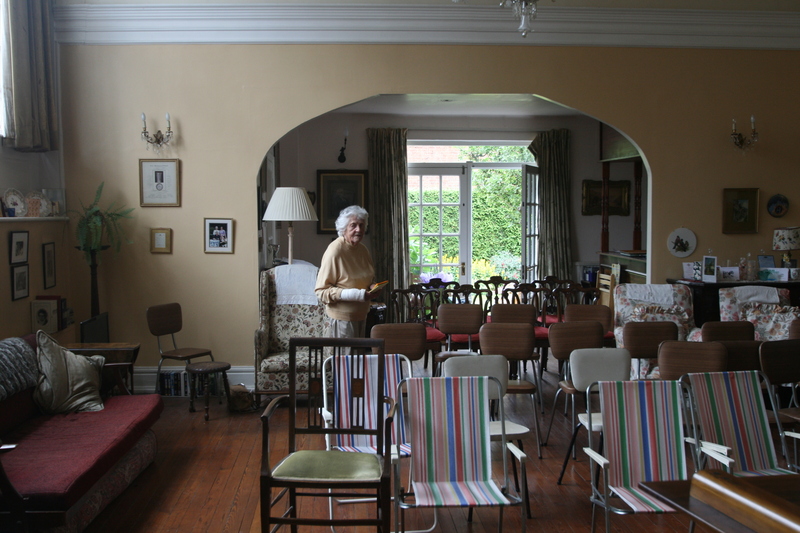 She was a stalwart of the Bedford Park Festival, holding two lunchtime concerts each year in her beautiful studio and garden in Blenheim Road, as well as a concert performed by her own music students. She was honoured as a ‘Fellow of the Bedford Park Festival’ for her contribution to it over decades. In her will, she asked that a Thanksgiving Evensong be offered in her memory and it seems appropriate that this should be done on the middle Sunday of this year’s Festival on June 19th, followed by a concert in church – one of those she had organised to be held in her Studio this year.